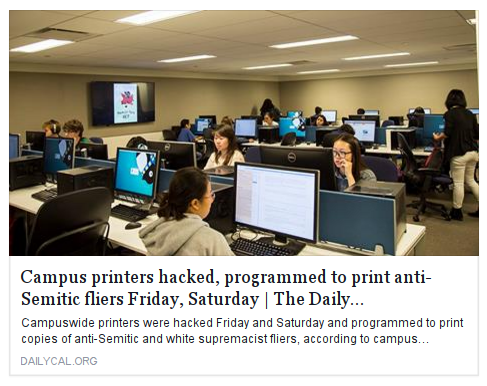 We were disappointed to find that the Daily Cal has published a misleading article about recent printer "hacking" at UC Berkeley. The OCF was not involved in this attack in any way. Our printers are not exposed directly to the internet, and our volunteer staff take security very seriously. We were quite shocked to see ourselves on the Daily Cal article. It's really unfortunate that a lot of people will see this image and think that the OCF was compromised. Our volunteer staff have put a lot of work into the OCF, and we don't like to see it tarnished this way. We appreciate that the article itself did not reference the OCF. And we'd greatly appreciate help from the Daily Cal in replacing the misleading photo and issuing a clarification. 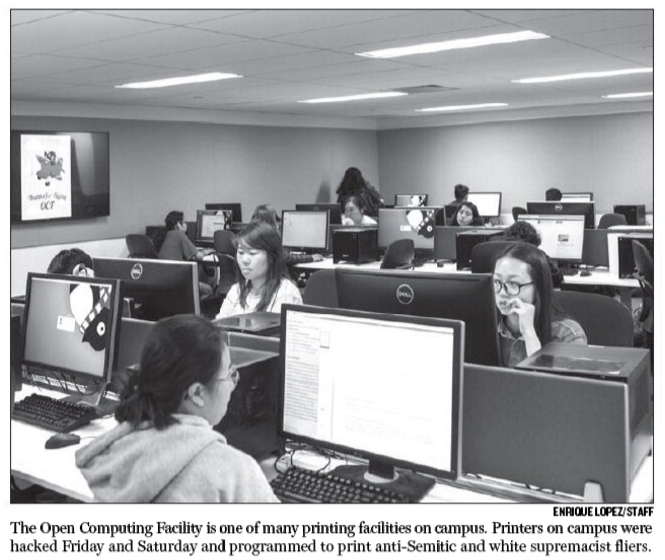 Update March 30: The Daily Cal has updated the caption of the photo, but refuses to correct their mistake by replacing the photo, citing "a pretty strict policy on retraction". While we're glad they've recognized the mistake and added the clarifying caption, we still believe they should act with integrity to correct this mistake. It is not responsible journalism to place the photo of a widely recognized but completely unrelated organization above an article about poor security practices. Many people don't read Daily Cal articles in full, but instead see snippets posted on Facebook or elsewhere. In these snippets, a picture of the OCF is still prominently featured, and the work of our volunteer staff is still being devalued. This could have been prevented if the staff of the Daily Cal had taken a few minutes to shoot us a quick email prior to publishing that article. A lot of damage has already been done. The Daily Cal should take responsibility for their error and correct it. Update April 1: The Daily Cal has now replaced the photo with one of a printer which was actually affected by the attack. We thank them for correcting the mistake.